My neighbor found this metal tool in a box from his father’s workshop. 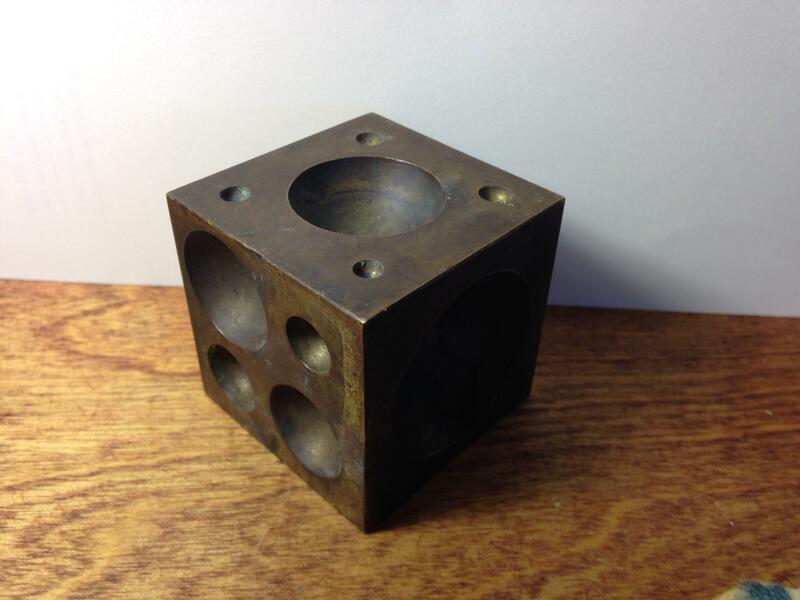 It's a cube with all sorts and sizes of circles and half spheres on every edge. Die for creating sheetmetal hemispheres. There should be a set of punches with round ball ends somewhere in that mix, unless someone misused them for something else or lost them. Doming Block and Punch Set is one term for the tool set. The die is also called a dapping block. You can find them at jewelry tool suppliers. What tool should I use to cut memory foam? What tool for easily cutting cardboard is child-safe? What is the best tool to grind down a smaller metal rod? What kind of saw should I use for cutting thin metal? What unpowered bladed tool can make deep beveled cuts in sheet material? What is this digging tool called? What is this electrical tool? What tool to tighten nut on kitchen faucet?